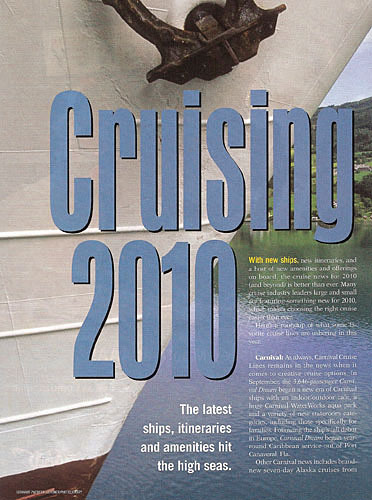 With new ships, new itineraries, and a host of new amenities and offerings on board, the cruise news for 2010 (and beyond) is better than ever. Many cruise industry leaders large and small are featuring something new for 2010, which makes choosing the right cruise easier than ever. Here's a roundup of what some favorite cruise lines are ushering in this year. CARNIVAL: As always, Carnival Cruise Lines remains in the news when it comes to creative cruise options. In September, the 3,646-passenger Carnival Dream began a new era of Carnival ships with an indoor/outdoor café, a huge Carnival WaterWorks aqua park and a variety of new stateroom categories, including those specifically catering to families. Following the ships fall debut in Europe, Carnival Dream began year-round Caribbean service out of Port Canaveral, FL. Other Carnival cruise news includes brand-new seven-day Alaska cruises from Seattle; three different John Heald Bloggers Cruises aboard the new Carnival Dream, catering to fans of the senior cruise directors very popular blog; fleetwide Your Choice Dining by summer 2010, offering traditional early and late seating, as well as Your Time open seating; short four- and five-day cruises out of San Diego to Cabo San Lucas, Mexico; the continuation of the only year-round service out of Mobile; and a one-third increase in capacity out of New Orleans. CELEBRITY: Celebrity Cruises has a new program called Celebrity Life introduced in mid-2009, that encompasses three long-established pillars of the Celebrity brand: dining, enrichment, and wellness. Celebrity Life enhancements fleetwide include eight new wine enrichment events, six spirits and mixology tastings, several interactive programs with chefs, Rosetta Stone® language classes, and additional spa and fitness offerings. With 85% of staterooms featuring verandas, the lines new Equinox is receiving rave reviews. CRYSTAL: Luxury cruise line Crystal Cruises continues to enhance its offerings to a loyal clientele, including more calls than ever on Croatia's Dalmation Coast; several new close-to-home offerings, including cruises from Boston and New York; an expanded focus on the Middle East during the always-sold-out World Cruise (108 days in 2010); a new Technology Concierge, who offers one-on-one instruction with gadget such as the iPods, Blackberry, and Kindle; and a variety of wine- and food-oriented Experiences of Discovery programs and cruises, featuring mixology and pastry classes and full-fledged culinary-themed cruises with premier chefs and wine experts. The line celebrates its 20th anniversary in 2010 with shipboard credits ranging from $2,000 to $10,000 per couple, up to $3,000 per couple savings in the Mediterranean and Northern Europe, and more. DISNEY: Disney Cruise Line continues to lure families--and even many couples without kids. New for 2010, the line is sending the Disney Magic to Europe for an unprecedented five-month season in northern Europe and the Mediterranean. The new 12-night Northern European Capitals cruise features Oslo, Copenhagen, Stockholm, and Warnemunde, Germany, as well as an overnight in St. Petersburg, Russia. The Mediterranean cruises bookend the Northern European cruises will sail out of Barcelona, Spain for 10- and 11-night cruises. In addition, the Disney Wonder will offer new four- and five-night summer sailings to Nassau, Bahamas, Key West, Fla., and Castaway Cay, Disneys award-winning private island. HOLLAND AMERICA: Long an innovator at sea and on land in Alaska, Holland America is adding a number of ports, shore excursions, land-based add-ons, and more for 2010. The Alaska options for 2010 include a new 14-day cruise offering, Alaska Adventurer; an expanded line-up of seven-day itineraries; more glacier viewing opportunities; new ports, offbeat shore excursions; and more land-based tours. The line will offer eight ships with almost 150 total departures from May 3 through September 24 with the new 14-day sailings from Seattle and the more traditional seven-day offerings sailing from Seattle, Vancouver, British Columbia, and Seward, Alaska. Holland America has also increased its Bermuda cruises, added Antarctica to the classic Grand World Voyage (114 days), and will welcome the Nieuw Amsterdam in mid-2010. PRINCESS: Ever-popular Princess Cruises has created new European offerings called Interludes. This new series of seven-day cruises includes possibilities in the Western Mediterranean, the Greek Isles, Scandinavia, Norway, Ireland, and Scotland. Featuring the intimate small ship atmosphere of the Ocean Princess, these sailings are often combined with an optional hotel stay in Rome or London. REGENT SEVEN SEAS: Upscale Regent Seven Seas Cruises will again offer a variety of enticements to sail in 2010, with the possibilities including two-for-one fares, free airfare, free unlimited shore excursions, cruise fares including governmental fees and taxes, and up to $1,000 per person in additional savings. In 2010, the popular Prime 7 grill/restaurant and Canyon Ranch spa will be on all three ships. ROYAL CARIBBEAN: In 2010, the huge (and hugely popular) Oasis of the Seas, which carrys 5,400 passengers, will begin western Caribbean itineraries including Cozumel and Costa Maya in Mexico and Royal Caribbeans private beach destination on Haiti. In addition, Legend of the Seas will be deployed year-round in Asia; Brilliance of the Seas will be in Dubai, United Arab Emirates; and Enchantment of the Seas will sail year-round out of Baltimore. WINDSTAR: Windstar Cruises remains popular with the sailing set. The lines news includes a new Caribbean itinerary out of St-Martin/St Maarten that allows more daytime sailing and evenings in port; a number of new ports in Italy, France, Greece, Croatia, and more; and an expansion of the popular Signature Collection Host Series, with renowned winemakers, chefs, writers, and more. PLANNING YOUR TRIP: To find out more about cruise options, contact a local AAA Travel agent or visit AAA.com/travel.